Join a Guided Optional Culinary Walk through Amsterdam to sample savory and sweet Dutch specialties or join a Guided Optional Excursion to Zaanse Schans to see historic windmills and charming Dutch houses. You may like to join a Guided Optional Excursion to Muiderslot Castle—Holland’s most beautiful, best-kept medieval castle. Choose a Guided Walking Tour of Cologne’s important Jewish heritage sites. Don’t miss the chance to enjoy free time over a glass of Kölsch pale lager—locally brewed for over 100 years! Later local musicians will join us on board for live entertainment. Enjoy free time in Koblenz before relaxing on the Sky Deck for a leisurely cruise through the Rhine Gorge to Rüdesheim. Sail past the legendary rock of the Lorelei—where the siren of mythology sang songs to lure ill-fated sailors. This magnificent river cruise begins in the ever popular, modern city of Amsterdam, Holland. The best way to see the treasures of this 700-year-old city is on a canal cruise along the elegant grachten lined with homes dating back to the city’s “Golden Age.” Cologne, Germany—a 2,000 year-old city known for its gothic architecture—will be an exciting stop with its famous twin-spired cathedral and Old Town with many shops, cafés, and taverns. 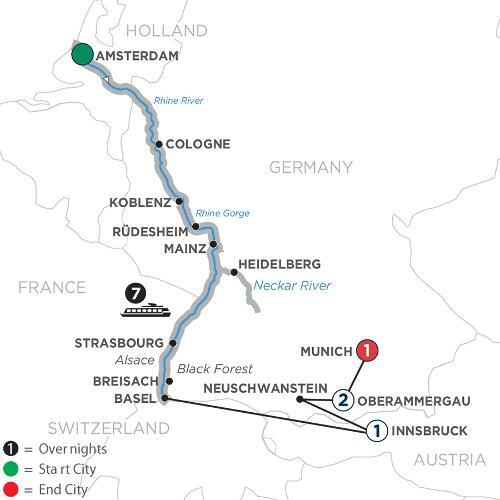 Pass through the dramatic Rhine Gorge—the most beautiful stretch of the Rhine River where ancient castles stand on cliffs 400 feet above the water. And nearby, in the charming wine town of Rüdesheim, visit the unique Siegfried’s Mechanical Musical Instrument Museum. Continue your Rhine river cruise to Mainz for a guided walk and visit to the captivating Gutenberg Museum, or take an excursion to Heidelberg to visit the ruins of its red-walled castle. In Strasbourg, France, you’ll be amazed by the red-sandstone gothic cathedral with ancient murals and fascinating astronomical clock. Also, stroll through the lovely La Petite France district with its quaint shops, delightful bistros, and peaceful waterfront promenade. Before the end of your European river cruise vacation, stop in Breisach, Germany, the gateway to Germany’s Black Forest—an area of unrivaled natural beauty—best known for Black Forest ham, cherry cake, and the cuckoo clock. Continue your European vacation on shore for a guided tour of Austria and Germany, starting with sightseeing in Innsbruck. Visit the spectacular Neuschwanstein Castle before the highlight of your trip—a visit to the idyllic Bavarian village of Oberammergau, Germany, to attend the “Passion Play”. Performed once every ten years by the residents of Oberammergau, the “Passion Play” is a stunning theatrical event dating back to 1634. Enjoy seating and accommodations in the heart of Oberammergau. Next, enjoy guided sightseeing in Munich, including Nymphenburg Palace, the Marienplatz, and gothic Frauenkirche. Sample Munich’s Biergärtens and cafés, and see the famous Glockenspiel. The perfect blend of adventure, relaxation, and inspiration—your Avalon Rhine River cruise with the once-a-decade performance of Oberammergau’s “Passion Play”—is truly a once-in-a-lifetime experience.